Brantford is a city in southwestern Ontario, Canada, founded on the Grand River. Start off your visit on the 3rd (Mon): examine the collection at Canadian Warplane Heritage Museum, then take in the architecture and atmosphere at Basilica of Our Lady Immaculate, and then look for all kinds of wild species at Rockwood Conservation Area. 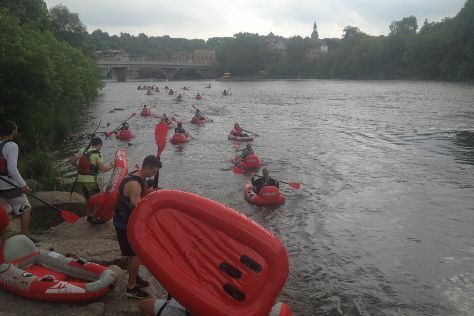 Get ready for a full day of sightseeing on the 4th (Tue): appreciate the extensive heritage of Galt, stop by Reid's chocolates, and then let the river carry you with Grand River Rafting Company. For other places to visit, photos, where to stay, and tourist information, go to the Brantford online itinerary creator. Toronto to Brantford is an approximately 1.5-hour car ride. Traveling from Toronto in July, Brantford is a bit cooler at night with lows of 17°C. Wrap up your sightseeing on the 5th (Wed) early enough to travel to Niagara Falls. 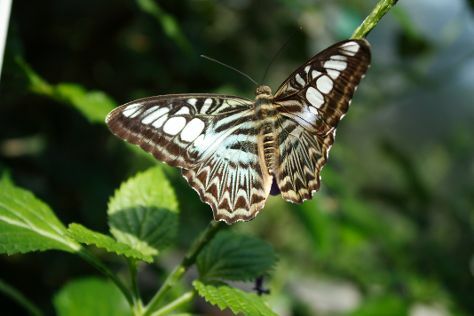 Kick off your visit on the 5th (Wed): identify plant and animal life at Niagara Parks Butterfly Conservatory, appreciate the extensive heritage of White Water Walk, and then stroll through Journey Behind the Falls. Get ready for a full day of sightseeing on the next day: examine the collection at Mackenzie Printery and Newspaper Museum, then admire the sheer force of Niagara Falls, and then get engrossed in the history at Port Colborne Historical & Marine Museum. For ratings, reviews, traveler tips, and other tourist information, go to the Niagara Falls vacation planner. You can drive from Brantford to Niagara Falls in 1.5 hours. Expect a daytime high around 32°C in July, and nighttime lows around 20°C. Finish your sightseeing early on the 6th (Thu) to allow enough time to drive to Toronto. Visit Casa Loma and The Distillery District for their historical value. Museum-lovers will appreciate Royal Ontario Museum and Hockey Hall of Fame. There's much more to do: admire the landmark architecture of CN Tower, admire nature's wide array of creatures at Ripley's Aquarium of Canada, get curious at Ontario Science Centre, and make a trip to Harbourfront Centre. To see ratings, more things to do, maps, and more tourist information, read our Toronto itinerary builder. You can drive from Niagara Falls to Toronto in 1.5 hours. Another option is to take a bus. July in Toronto sees daily highs of 32°C and lows of 21°C at night. Cap off your sightseeing on the 10th (Mon) early enough to travel to Quebec City. 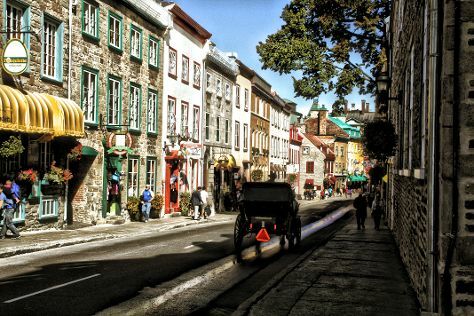 Popular historic sites such as Old Quebec and Place Royale are in your itinerary. Next up on the itinerary: immerse yourself in nature at Montmorency Falls Park (Parc de la Chute-Montmorency), get to know the fascinating history of Terrasse Dufferin, learn about all things military at La Citadelle de Quebec, and get your bearings at Morrin Centre. To see reviews, traveler tips, other places to visit, and more tourist information, read Quebec City vacation planner. Fly from Toronto to Quebec City in 4.5 hours. Alternatively, you can drive; or take a train. In July, daily temperatures in Quebec City can reach 32°C, while at night they dip to 19°C. Wrap up your sightseeing by early afternoon on the 15th (Sat) to allow time for the car ride to Montreal. Let the collections at The Montreal Museum of Fine Arts and Biodome de Montreal capture your imagination. Get in touch with nature at Mont Royal - Mount Royal and Place des Arts. There's still lots to do: make a trip to Notre Dame Basilica, admire the natural beauty at Montreal Botanical Gardens, get to know the fascinating history of Old Port of Montreal, and pause for some serene contemplation at Notre-Dame-de-Bon-Secours Chapel. To see ratings, reviews, and more tourist information, go to the Montreal online itinerary creator. Drive from Quebec City to Montreal in 3 hours. Alternatively, you can take a bus; or take a train. In July in Montreal, expect temperatures between 30°C during the day and 20°C at night. Finish up your sightseeing early on the 20th (Thu) so you can catch the train to Ottawa. On the 20th (Thu), take in the spiritual surroundings of Notre Dame Basilica, then examine the collection at National Gallery of Canada, and then ponder the world of politics at Parliament Hill and Buildings. Here are some ideas for day two: brush up on your military savvy at Canadian War Museum, look for gifts at CATS R US, and then hike along Rideau Canal. To see maps, other places to visit, photos, and other tourist information, refer to the Ottawa itinerary maker. Take a train from Montreal to Ottawa in 2 hours. Alternatively, you can drive; or fly. Traveling from Montreal in July, plan for little chillier nights in Ottawa, with lows around 17°C. Finish your sightseeing early on the 22nd (Sat) to allow enough time to travel to Banff National Park. Museum-lovers will get to explore Cave and Basin National Historic Site and Willock & Sax Gallery. Step out of the city life by going to Banff National Park and Lake Louise. Step out of Banff National Park to go to Yoho National Park and see Emerald Lake, which is approximately 38 minutes away. There's much more to do: explore the activities along Moraine Lake, take in breathtaking views at Johnston Canyon, cruise along Bow Valley Parkway, and appreciate the extensive heritage of Fairmont Chateau Lake Louise. To find maps, traveler tips, other places to visit, and more tourist information, read Banff National Park vacation builder. Traveling by combination of flight, shuttle, and bus from Ottawa to Banff National Park takes 9.5 hours. Alternatively, you can drive; or do a combination of train and bus. Traveling from Ottawa to Banff National Park, you'll gain 2 hours due to the time zone difference. Prepare for little chillier weather when traveling from Ottawa in July: high temperatures in Banff National Park hover around 23°C and lows are around 6°C. Cap off your sightseeing on the 28th (Fri) early enough to catcht the bus to Jasper National Park. You'll explore and learn at Jasper-Yellowhead Museum & Archives and Mountain Galleries. 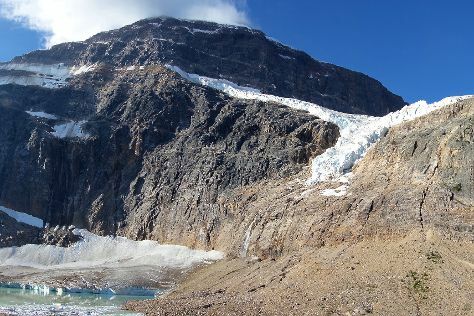 Step out of the city life by going to Mount Edith Cavell Trail and Athabasca Falls. There's much more to do: take in the dramatic natural features at Mt. Edith Cavell, look and learn at The Jasper Planetarium, contemplate the waterfront views at Pyramid and Patricia Lakes, and stroll through Columbia Ice Field. To find photos, other places to visit, traveler tips, and tourist information, you can read our Jasper National Park trip itinerary planner. Traveling by bus from Banff National Park to Jasper National Park takes 2 hours. Alternatively, you can drive. While traveling from Banff National Park, expect a bit warmer days and about the same nights in Jasper National Park, ranging from highs of 28°C to lows of 8°C. Finish your sightseeing early on the 3rd (Thu) to allow enough time to travel to Victoria. Kick off your visit on the 3rd (Thu): admire the landmark architecture of Empress Hotel National Historic Site of Canada. Get ready for a full day of sightseeing on the next day: stroll through Victoria Butterfly Gardens, then step into the grandiose world of Craigdarroch Castle, and then examine the collection at Royal BC Museum. To see traveler tips, where to stay, reviews, and other tourist information, refer to the Victoria vacation builder. Traveling by combination of bus and flight from Jasper National Park to Victoria takes 8 hours. Alternatively, you can do a combination of bus and flight; or do a combination of car and ferry. The time zone changes from Mountain Standard Time to Pacific Standard Time, which is usually a -1 hour difference. Expect little chillier weather when traveling from Jasper National Park in August: highs in Victoria hover around 22°C, while lows dip to 15°C. Cap off your sightseeing on the 6th (Sun) early enough to catch the flight to Vancouver. Take a break from the city and head to Granville Island and Seawall in Vancouver. Visit Lighthouse Park and Deep Cove for their historical value. Change things up with a short trip to Steveston Heritage Fishing Village in Richmond (about 36 minutes away). There's lots more to do: tour the pleasant surroundings at Stanley Park, explore the activities along English Bay, contemplate the long history of Yaletown, and see the interesting displays at Museum of Anthropology. For other places to visit, traveler tips, where to stay, and tourist information, you can read our Vancouver vacation builder. Traveling by flight from Victoria to Vancouver takes an hour. Alternatively, you can take a bus; or do a combination of ferry and car. While traveling from Victoria, expect a bit warmer days and about the same nights in Vancouver, ranging from highs of 28°C to lows of 17°C. Wrap up your sightseeing by early afternoon on the 10th (Thu) to allow time for travel back home.